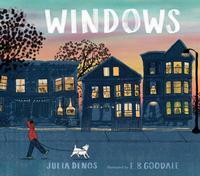 When I go for a walk or ride on a bus through the city streets as night begins to fall, I can’t help but look at windows. As I pass each townhouse or apartment, I get a glimpse of a different world: a kitchen, a living-room, part of a bookshelf, a painting, a cat, plants, families. It’s fun to imagine different homes and lives, going on side by side. Which brings us to our next title for Picture Book Highlights, a series of posts where we put the spotlight on a brand-new book that has been ordered for all of our libraries. This month's selection is Windows by Julia Denos, illustrated by E.B. Goodale. A child in a comfy red hoodie takes a dog for a stroll just as day begins to fade. As they walk through their neighborhood, lights go on inside the houses and apartments, offering a glimpse of what's going on inside. There's a lot to see and wonder, as we take the stroll together on the page. And, reassuringly, as the child and dog return home, the light on the window shows his mother, awaiting his return. Sure to inspire late afternoon strolls through your own neighborhood!